While cows on Old MacDonald's farm might have said moo, cows around the world make a variety of other noises to communicate a variety of emotions. Cows are more sensitive to noises than humans and are surprisingly communicative. Snorts, grunts and bellows are all part of the cattle vocabulary. Understanding a cow's language helps prevent injuries to humans and can lead to better animal husbandry practices. Even for the most experienced cattleman, bulls can be dangerous and unpredictable. Quick to feel threatened, a bull's defensive posture usually will include grunts or snorts. A side posture including a lowered head and arched back tells you the bull is feeling threatened in some way. If he faces you head on, accompanied by the snorts or grunts, vigorous pawing with his front feet, head shaking and even scraping the ground with his horns, the bull has entered a fight or flight state. At this point, your best defense is to keep your eyes on the bull while backing slowly toward the nearest point of exit. In October 2013, police dispatchers in Newbury, Massachusetts received numerous phone calls reporting a disturbance at a local dairy farm. The strange noises had alarmed the community to the point the sheriff finally issued a statement to the public. Female cows, separated from their newly weaned calves, were bellowing and crying. 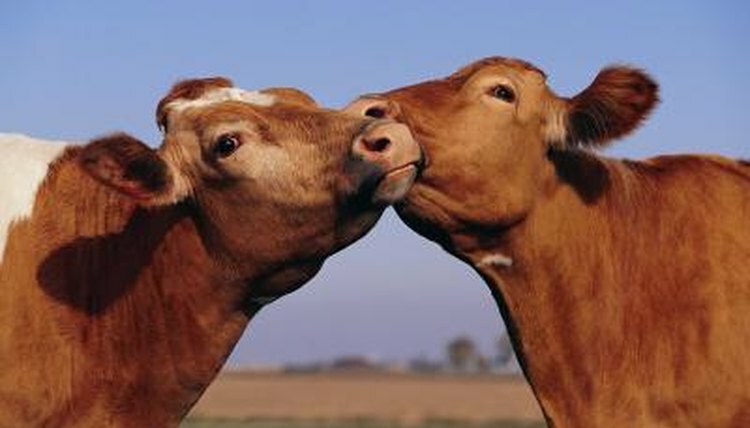 Cows form strong bonds with their offspring which, if allowed, will last a lifetime. Cows separated from recently born offspring experience tremendous grief and distress, and will express their pain with mournful bellows. In the wild, high-pitched sounds are generally used as an alarm to alert others that a predator or other danger is near. Calves will use a variety of high-pitched bleats and bawls to alert their mothers that they are in distress. Whether they have become separated from the herd, are injured or hungry, or sense danger nearby, calves will make plaintive cries to express their distress. With a little observation, it's easy to see cattle have a vocabulary that extends far beyond the basic moo. Cattle vocabulary includes a variety of sounds which, when coupled with specific behaviors, express a variety of thoughts, feelings and emotions. A cow can tell you if she's sick, cold, scared, curious, playful, frightened or defensive. Understanding the language of cows could be the key to keeping you safe around them, or to providing better care for your own cattle.